Top of the Tuesday morning to you!!! It's Melissa from M Miranda Creations and today is my day to post here on the Jaded Blossom blog. I have a cute gable box to share using a technique that I have never tried before - stamping on canvas. I took a kraft gable box and cut a red canvas sheet to make some panels for the sides. Before adhering them, I used some Memento Tuxedo Black ink and stamped on the design to the canvas using the new Heart Splatters stamp set. I then took the Luggage Tag Dies and cut the back layer using a sheet of kraft paper and cut the top layer using the red canvas again. I took another stamp from the same Heart Splatters stamp set and again stamped a background. Then I stamped the heart from the same set onto another piece of kraft paper and fussy cut around it. I adhered it to the tag with pop dots. 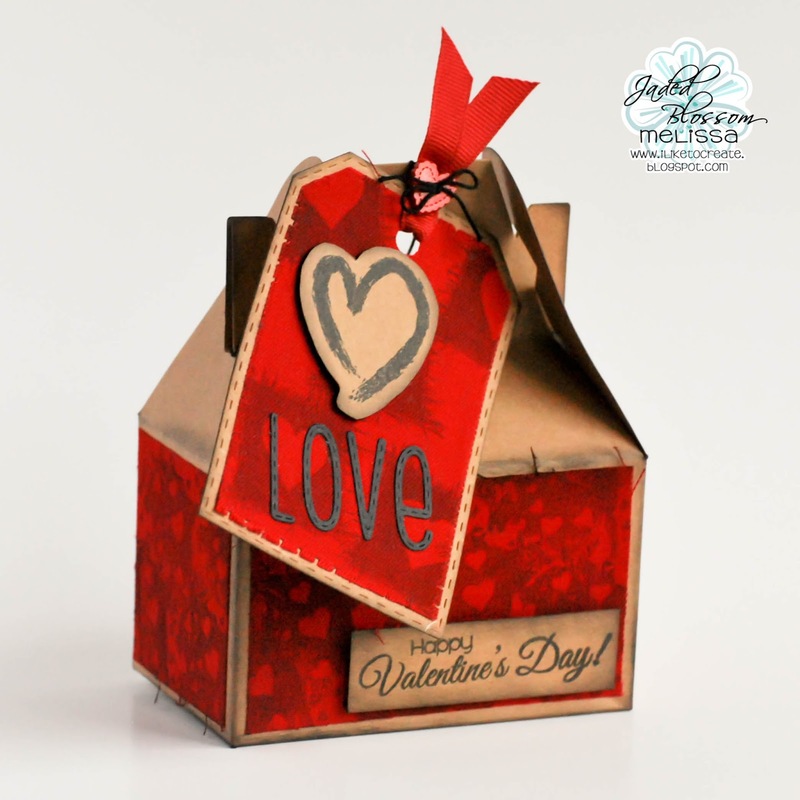 The love sentiment was die cut from the new Alphabet Dies and glued on to finish off the tag and then it was tied to the top of the box. I also added a sentiment to the box using the Simple Sayings Valentine Edition stamps. This is a great box to stuff with chocolate treats or a small gift. And I am so glad that the stamping on canvas was a success for me. Yeah!!! I really like how it turned out. Boxes are so cool. Haven't done them yet.